Welcome to Boyle Angling. This site was created to tell you about angling in Boyle, where to fish, what fish you might expect to catch, the best methods and to tell you about the town of Boyle itself. Angling is a marvellously mellow way to see some of the most spectacular scenery, natural flora and fauna of Boyle and its environs. Boyle is renowned as one of the major fishing venues in Ireland and over the years has hosted all the main fishing festivals in the country. Our rivers, lakes and streams carry an abundance of coarse fish. 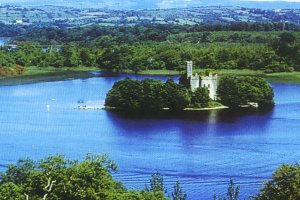 Cavetown Lake and Lough Arrow must be two of the best trout lakes in the country. The wonderful lakes of the area, Lough Key, Lough Arrow and Lough Gara attract fisherman from all over Europe, making the region one of the most popular angling destinations in the country. Renowned for its musical tradition, Boyle offers a wide variety of live entertainment all year round. Add to this its natural unspoilt beauty of the countryside, the many facilities in the area, the lively pubs and the famous hospitality and friendliness of the people and you have the makings of an enjoyable and memorable stay in Ireland's North West.